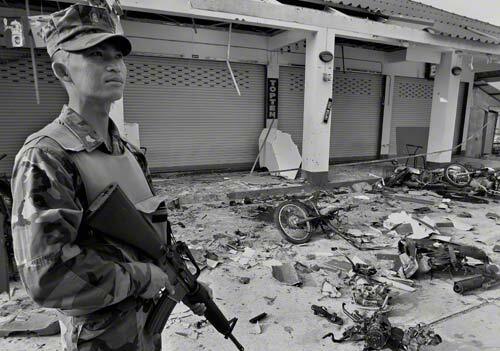 A Thai soldier on guard as motorcycles lie wrecked in front of bars behind the Marina Hotel in Sungai Kolok district, Narathiwat province, 1,200 (720 miles) south of Bangkok, near Thailand�s border with Malaysia, on Sunday 28 March 2004. A remote-controlled bomb exploded injuring at least 30 people. It was placed on an abandoned motorcycle near busy tourist businesses and detonated around 7.30 p.m.